In 2005, the State of California banned the practice of hand weeding crop fields in order to protect farm workers from lifelong back pain. Because they don’t use herbicides, California organic vegetable growers employ farm workers to pull weeds by hand and claimed that hand weeding was absolutely essential to maintain high profits on organic produce. As a result of their lobbying, the California organic vegetable companies were exempted from the worker protection rule. 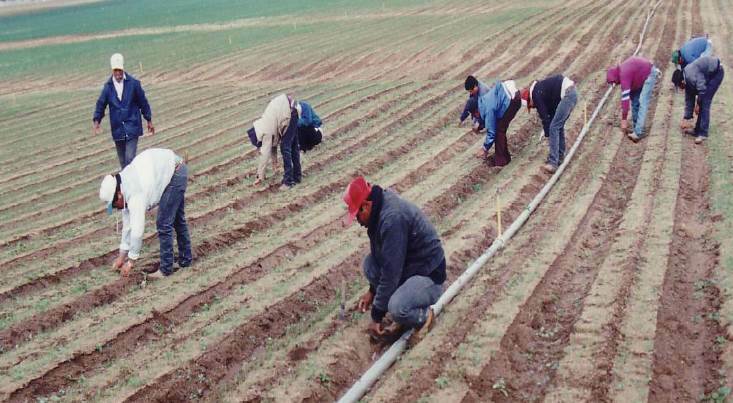 In 2004 farmworker groups lobbied the California Occupational Safety and Health Administration to restrict hand-weeding. Organic farmers led the backlash against the proposal. While they have devised many creative tactics for banishing weeds without pesticides—singeing them with torches, slicing them with disks, allowing them to flourish before planting and then mowing them down—every organic farmer I talked to insisted there’s only one way to completely rid your crop of pesky plants: sitting, kneeling or bending, plucking them out one by one. Source: The Nation. September 11th, 2006. This entry was posted in Herbicides and tagged back pain, California, crop fields, hand-weeding, Herbicides, lobbying, Organic, organic growers, organic vegetable growers by pesticide guy. Bookmark the permalink.